Note: The DCX-PC 100 series motion controllers are no longer recommended for new applications. If you have a new application that requires servo or stepper control, please see the MultiFlex motion controller family instead. The DC2-PC series motion control 1 or 2 servo axes via analog ±10V DC servo control signals and can be configured to provide two axes of on-board PWM amplified servo drive signals for small DC servo motors. This can eliminate the need for separate, external power amlifiers to drive the motors. 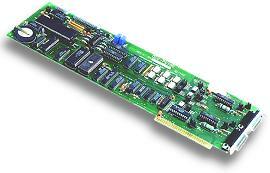 DC2-PC motion control cards do not rely on a PC for any processing functions, so they deliver the same level of performance in stand-alone applications as they do when installed in a PC. Click on the link below for a graphical feature list.. Economical 2-axis servo controller and stepper indexer.